Amazon.com (NASDAQ:AMZN) stock isn’t too large for an investor to understand, but it may be too diverse for investors to truly grasp the concept. Amazon is entering industries at an unheard-of rate and, sometimes, breaking things along the way. Essentially, Amazon is a services company. It grows by re-selling cloud services, through Amazon Web Services, and creating other services that use its cloud. The meaning of everything Amazon is doing today is that the cloud revolution has barely started. But how does Amazon, and AMZN stock, profit? The easiest way is to sell it. Amazon sold over $25 billion in cloud services last year. The harder way is to use it for services that interface with the real world. Retailing is just one such service. That’s where people get confused because interfacing with customers has made Amazon into a logistics company. It is just as rigorous in cutting unit costs in delivery as it is in cutting the costs of processing in its cloud. Whether Amazon opens or closes physical locations matters less than that customer relationship. Amazon’s goal is to climb what Seth Godin, 20 years ago, called the “ladder of permission.” A purchase is a low level of permission. Success in selling builds a reputation, which lets Amazon compete at higher permission levels. Subscriptions, however obtained and whatever they are for, are a higher level of permission. Goods don’t all have to be physical. If France makes Amazon pay a 3% tax on all its French sales, Amazon can simply split its physical sales network from the rest of the company. Retailing creates cash flow to build the cloud, but it’s a low-margin business. Services carry higher margins than goods. Amazon is already turning books, TV, music and movies into services it sells by subscription, either bundled (as in Amazon Prime) or separately (as in Amazon Music and Kindle Unlimited). It does this on a global level. But entertainment is not the only kind of high-margin product that can be stored and sold through the cloud, once you have subscription permission. You can sell drugs, financial products, or transaction services. Combining subscription permission, real-world logistics, and the economics of cloud will get Amazon into the health insurance business, which it now calls Haven. At first, this will only cover employees at three companies – Amazon, JPMorgan Chase (NYSE:JPM) and Berkshire Hathaway (NYSE:BRK.A). There are about 1.5 million people at these three companies, and health care is one of their biggest expenses. Demonstrating savings, internally, would be a huge win. But if Amazon can succeed with its own employees, it can also succeed with yours, using the same system. It doesn’t have to abuse its data relationship with you to do this. It benefits most if it doesn’t, which is not the case with cloud rivals like Facebook (NASDAQ:FB) and Alphabet (NASDAQ:GOOGL). It’s monetizing data as subscriptions, creating private transactions with customers, not public goods shared with advertisers, which is Amazon’s secret sauce. Amazon’s machinations with its store, with cloud services, even with media, are not why you should buy AMZN stock today. Financial services today represent 20% of GDP and healthcare delivery (as opposed to its financing) represents 7% more … No company is better positioned, technologically and logistically, to seize the high ground in those opportunities than Amazon. That’s why long-term investors should buy Amazon stock with both hands. Dana Blankenhorn is a financial and technology journalist. He is the author of a new mystery thriller, The Reluctant Detective Finds Her Family, available now at the Amazon Kindle store. Write him at [email protected] or follow him on Twitter at @danablankenhorn. As of this writing he owned shares in JPM and AMZN. 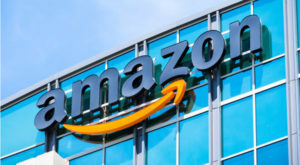 Article printed from InvestorPlace Media, https://investorplace.com/2019/03/buy-amazon-stock-cloud-services/.